You are thousands of years old. You have amazing powers. You have watched civilizations rise and fall-- so why does no one remember any of this? 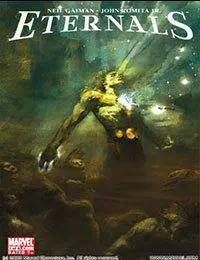 Bestselling Author Neil Gaiman (Marvel: 1602, Anansi Boys, Sandman) is joined by superstar artist John Romita Jr. (Amazing Spider-Man, Wolverine) to bring you the eagerly-awaited event of 2006-ETERNALS!! Ike Harris has dreams of adventures, love affairs and betrayals, but no one involved remembers or believes him. And who is trying to kill him to keep him from talking about it?